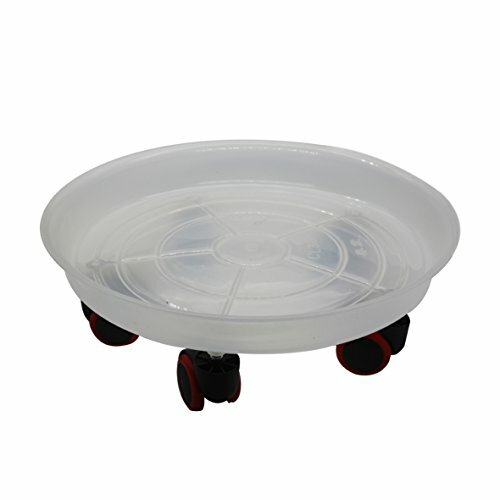 2Pcs Round Plant Dolly with Wheels Plant Caddy for Balcony Garden/Office/Home Gardening/Nursery (16.5in) by coisound 1688 at Tulips Orchids. Hurry! Limited time offer. Offer valid only while supplies last. Size: our flower pot caddy is 11.8/12.9/14.9/16.5/18.1inch in diameter. This round planter stand is big enough to hold large and heavy planters or flower pot and moving around your home. This plant stand is consist of 4/5 heavy duty wheels and not easy to break., water leak proof, indoor large green plants necessary. This low plant stand with wheels can be widely used indoor and outdoor for moving garden pots, heavy plants, large potted trees, large vases, whiskey barrels, or heavy trash cans and can protect your floor from being worn out.Easy to move, high quality rubber pulley, rolling smoothly. Multi Names: Plant Stand with Wheels , Plant Stand with Rollers , Plant Caddy , Plant Dolly , Planter Holders. If you have any questions about this product by coisound 1688, contact us by completing and submitting the form below. If you are looking for a specif part number, please include it with your message.